Kat Black has created a sumptuous tarot deck using a sophisticated collage technique that brings new luster and meaning to the European masterpieces she has assembled for this special deck. Each painting been meticulously researched and chosen specifically for its divine evocations. While her deck remains true to the original Rider-Waite traditional symbolism, Kat Black offers accessible tarot interpretations that are fresh and welcoming. The cards are treated with gilt edges and are presented in a deluxe display box. 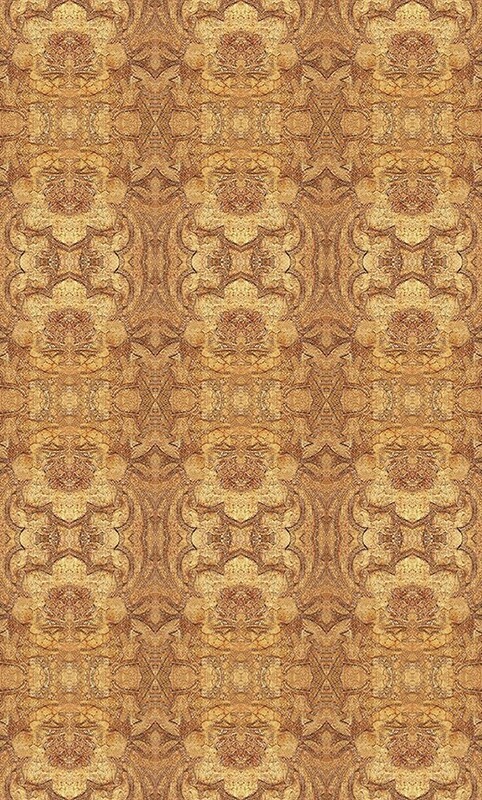 The card backs’ repeating patterns are symmetric, allowing for reversed readings. Golden Tarot comes with an illustrated 198-page book, which provides discussions of the artwork, descriptions, and interpretations for both upright and reversed meanings. An appendix identifies the sources for the artwork incorporated into Golden Tarot. "From a time of violence, pestilence and oppression came poignant images of gentle beauty and human frailty. They speak to me of a truth that is timeless, and hope that flowers even in the darkest conditions. I hope that they also speak to you." 78 cards, 2.875" x 4.75" Book, 2.75" x 4.75", 198 pp., b&w illus., pb. 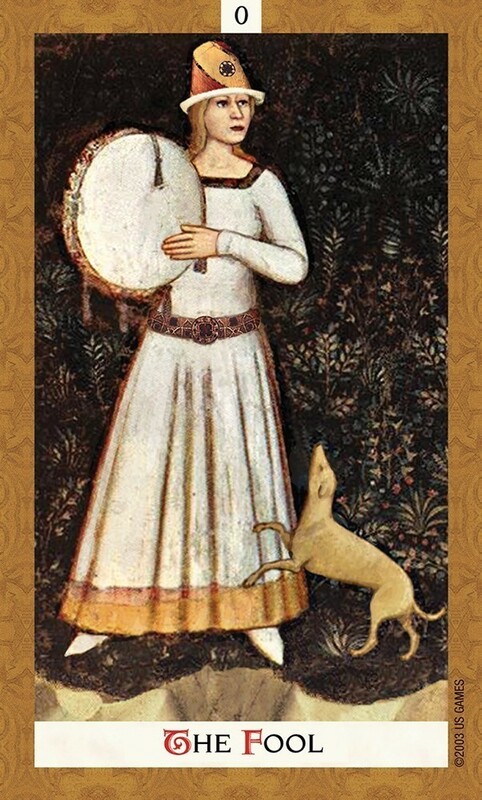 A great deal of work and skill went into choosing and blending the images from 13th to 16th century paintings to create Tarot scenes that look whole, and the overall effect is amazing. I knew that cards were composites, collages, but when riffling through them I soon forgot, as the elements naturally flowed into one another without abrupt edges, colour or lighting changes. (On first glance at the Fool, I thought it was one image. The source notes say it is actually four: the woman and garden, the dog and cliff, the silly hat, and the jewels.) I also found the authenticity of the images meant their facial expressions and body language convey their meaning and intent with great effect. One of my favourites was the Page of Swords -- he looks like he is mere seconds away from swinging that sword with a flourish. In addition to its impressive imagery, the deck is also beautifully presented. The cards have been given the luxury treatment, printed on stiff cardboard with gilded edges. The outer packaging is a box of thick, matte cardboard. Rather than a flip-top, the box has a separate lid that slides onto the base. Fitting neatly inside the box are the 78 Tarot cards (the backs are a low-key cream and tan pattern, reversible), a title card, a card with a few words from Kat Black, and a 200 page bound companion book. The Golden Tarot book (which, despite its diminutive size, is a bound book and not a stapled booklet) is the same size as the cards. 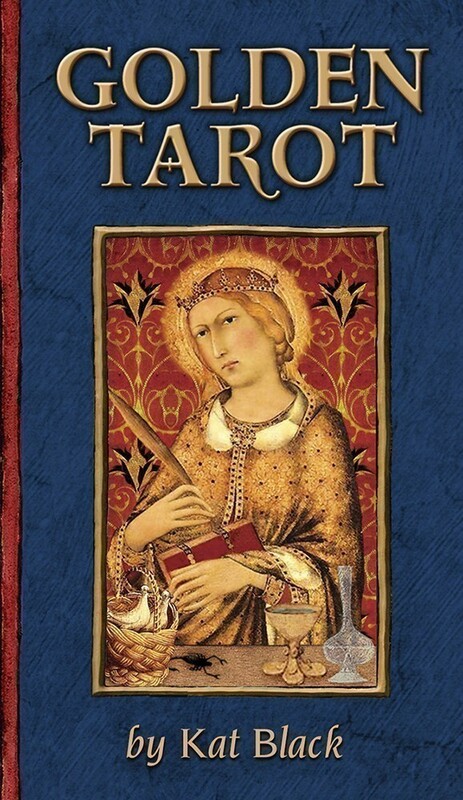 It doesn't spend any time on tarot basics, containing instead an introduction from the author describing the creative process and background to the cards, four spreads, the card meanings, and a substantial section citing the sources for each artistic element. As Kat has stayed away from well-known artworks -- the Michelangelos, the da Vincis - to concentrate on lesser-known artists, this section is useful and surprisingly fascinating. The Golden Tarot is an easily accessible deck for beginners, or a wonderful addition to the collection for the more experienced reader. Highly recommended. From the moment that I started hearing about this deck, I knew that I wanted to have it in my hands! Having it in my hands did not disappoint -- it is a gentle, gracious deck that U.S. Games has presented in a very worthy manner. The artwork is digital collage -- and you generally do have to look to see where the collage "happened". It is fascinating to read that there are twenty layers to each picture and that each layer was manipulated to make the picture appear as cohesive as possible. I would say that Kat Black has done a stupendous job here! This is one of the most beautiful and carefully prepared tarot decks I have ever seen: truly a work of impeccable art! From the moment one views this superb deck, the essence of bygone elegance and sophisticated packaging come to mind. Not only are the images from a bygone era, but the way the cards are presented speaks of the care and luxurious aesthetics of yesteryear. Created by Kat Black and published by the well-established company, U.S. Games, this deck offers timeless beauty and a sense of refined inquiry to your tarot reading sessions. 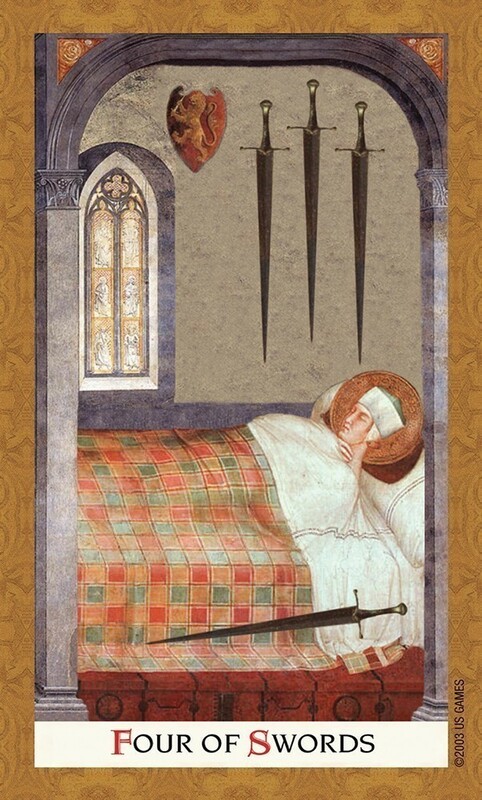 Kat combines images from the Medieval, early Renaissance, and particularly the International Gothic period to provide well-known yet unique interpretations of the various cards' symbolic meanings. She particularly focuses on art from the periods 1300 to 1500 A.D. Kat deliberately chose to conform to the card styles introduced by the traditional Rider-Waite-Smith deck, but her own version offers a genteel, softer and much more personable version, in my humble opinion. The box that protects the cards is gorgeous -- deep lapis blue and burgundy accented with gold embellish this sturdy, perfectly sized box: it looks like an elegant jewelry box. Inside, the cards are perfect for fitting in the hand, and feel wonderful as you hold them; the gold gilt edges give off a cool royal feeling as one listens to and touches the cards during shuffling, choosing and reading. A rare treat in this day and edge of plastic wrap and cheap paper. The publishers should be commended on their devotion to fine craftsmanship and customer experience. 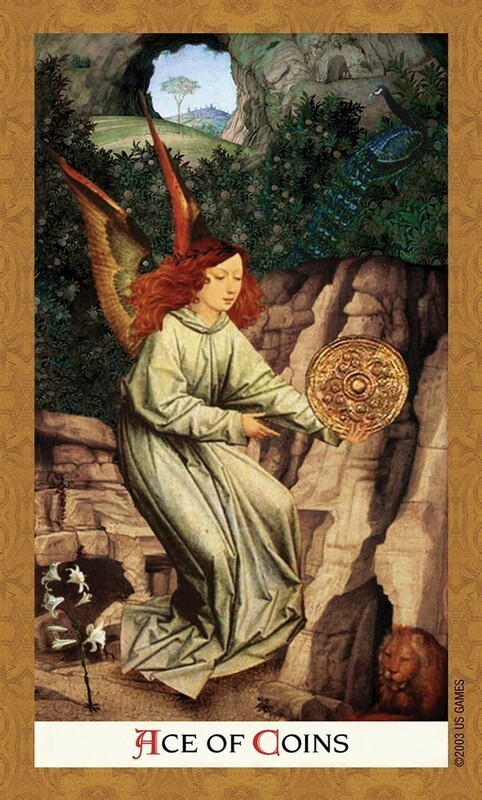 During the first half of the 2000s I taught a very popular special series of tarot classes called “Important New Tarot Decks.” Each class would feature a newer deck that I thought was significant in its readability and unique contribution to the tarot world. Kat Black’s Golden Tarot was one of my most popular classes in the series. 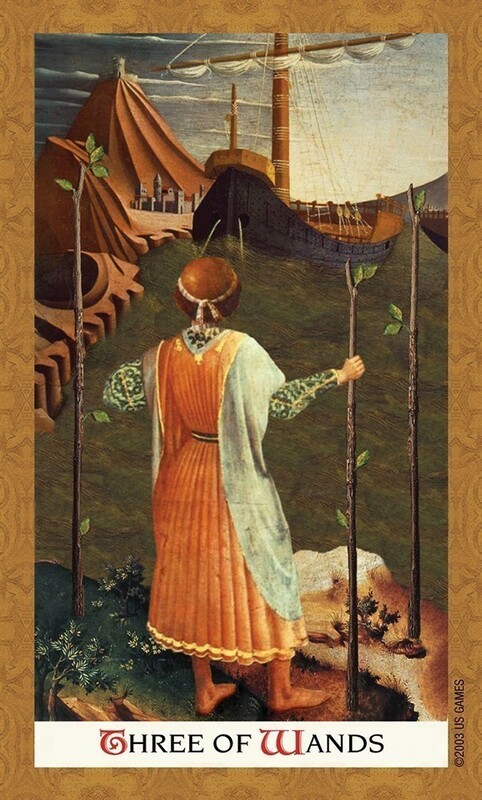 Golden Tarot follows RWS imagery in a way that makes it easy to use, but uses richer period artwork in a way that feels really authentic. Golden Tarot is a 78-card tarot deck published in 2003 by U.S. Games Systems, Inc. Often U.S. Games adds value to certain decks with really creative packaging. The special box that holds the deck and book is in itself remarkable, and makes it easy to develop a practice of drawing a card each day directly from the box. The cards are standard sized with an old-fashioned brown textured pattern for the reversible card back. 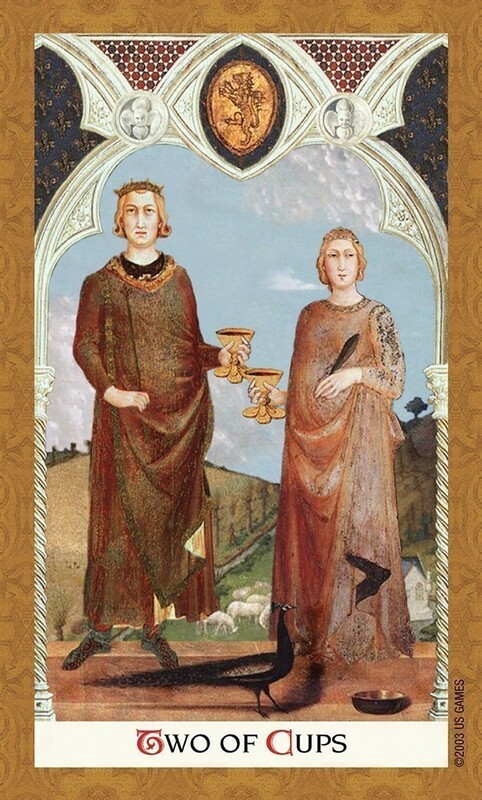 Strength is card 8 and Justice 11. The suits are Swords, representing the medieval ruling class, Wands, representing the peasant class, Cups, representing the clerical class, and Coins, representing the merchant class. The court characters are Pages, Knights, Queens and Kings. The deck is completely illustrated with digital collage that uses elements from renaissance masterpieces. The resulting card images are very similar to the Rider-Waite-Smith images in terms of symbolism and action. The Waite-Smith Tarot images are the most popular in the world. Many say they are the easiest to learn. 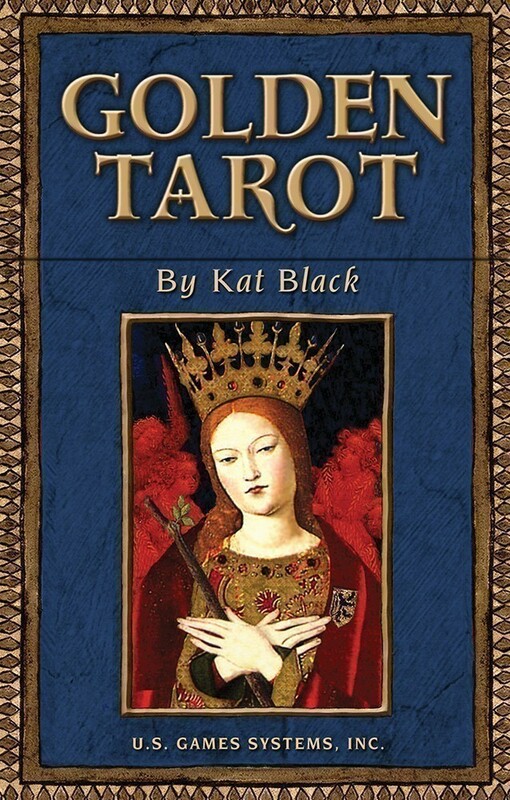 Current historical thinking says that tarot itself came from Italy in the late 1400s – essentially the same time and place that produced the works of art that Kat Black has used to illustrate Golden Tarot. From the world that gave birth to tarot Kat Black has taken art, added to it the wisdom of A.E. Waite and Pixie Smith and produced a truly readable deck that honors the mediaeval origins of tarot. The accompanying booklet fits nicely in the box. A little more than half the book is dedicated to insightful, understandable card interpretations. The rest of the book includes a lengthy list of the original art from which images were sourced for each card. Golden Tarot is a perfect deck for someone who loves Rider Waite Smith imagery, wants to honor the medieval roots of the original tarot and enjoys art from the Middle Ages and early Renaissance. Visually, the feel of Golden Tarot is rich, intricate, expressive and a bit somber, exactly as we expect art from the Middle Ages to be. I remember wishing, years ago, for a truly medieval deck that was illustrated with the same images as symbols as the Rider Waite Smith. 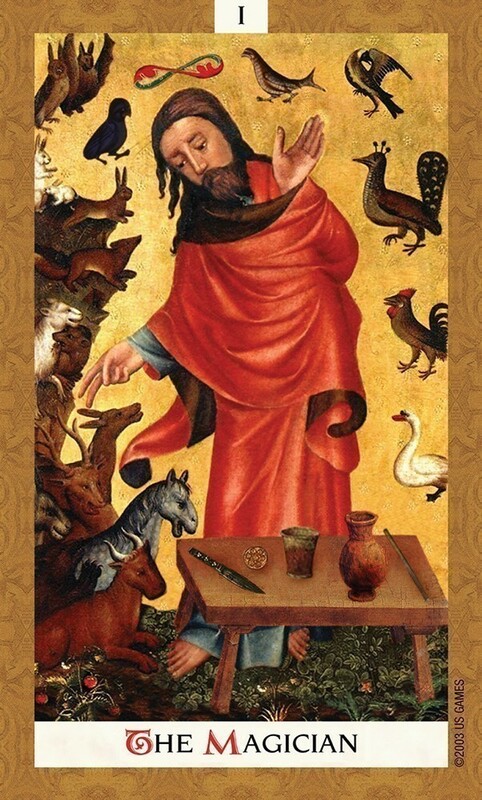 With Golden Tarot, my wish was fulfilled.